LATAM Airlines group continues to expand internationally as weak economic conditions within Latin America linger. The company has already slashed growth targets for Brazil, which is LATAM’s largest domestic market, and one of the weakest economies within the region. LATAM’s latest round of international flights includes linking its Lima hub to Washington DC and proposed new service from Sao Paulo to Johannesburg. The company also aims to bolster its connections to the Caribbean with flights from Bogota and Brasilia to Punta Cana. Those new routes join other long haul additions in 2015 including Sao Paulo to Barcelona, Toronto and Cancun, Lima to Orlando and Santiago to Milan. The moves show the balance LATAM is attempting to strike in building its network utility and deploying capacity to stronger markets while managing falling demand in weaker regions. 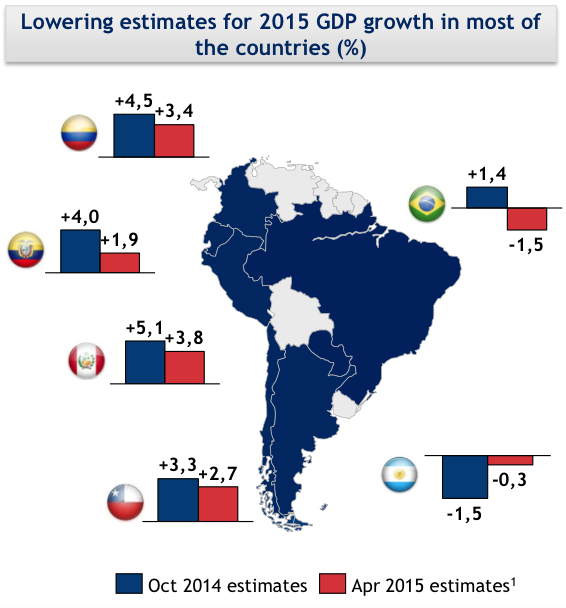 Unfortunately, it appears the challenges within Latin America will remain in place for the short term as growth prospects for the region’s major economies have been refined downward for 2015, and modest growth is predicted for 2016. LAN plans to launch new service between its Lima hub and Washington Dulles in 2H2016. Those flights follow LAN’s new service from Lima to Orlando International that debuted in Jun-2015. During the last couple of years LATAM has cited the importance of the Lima hub in the combined network of LAN and TAM to leverage north-south traffic flows. Lima is LATAM’s third largest base measured by seats. It is also the company’s third largest base measured by ASK deployment. Peru’s economic outlook is more stable than other economies in the region. But its GDP growth for 2015 has been revised from a projected 4% growth in late 2014 to 2% in Apr-2015 (based in information from LATAM, see background information). LAN already serves New York JFK, Orlando and Los Angeles from Lima, and also codeshares with fellow oneworld partner American Airlines on its flights between Lima and its hubs in Miami and Dallas/Fort Worth. The new service to Washington Dulles rounds out LAN’s service to the US from Lima, providing coverage to key regions including the US west coast, the New York metro area, the mid-Atlantic states, Florida and Texas. Lima not only serves as a strong connecting point, but also is a solid O&D market given the growth in Peru’s tourism industry. According to data from the Peruvian government, roughly 456,451 US-based tourists travelled to Peru in 2014, up 4% from the year prior. As the largest airline operating at Peru’s major gateway Lima Jorge Chavez International, LAN can capitalise on that growth. LATAM has sought authority for TAM to launch flights from Sao Paulo Guarulhos to Johannesburg, which would mark the first African route for an airline based in Latin America. South African Airways and TAM have been codesharing on SAA's flights from Johannesburg to Guarulhos since 2013, so obviously TAM has some knowledge of demand and traffic flows on the route. 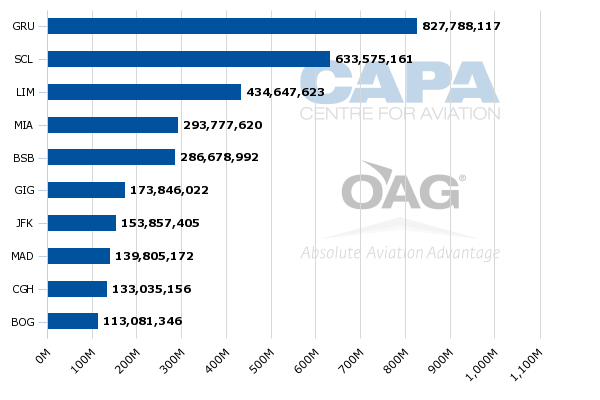 South African Airways is the second largest operator between Africa and upper South America, according to data from CAPA and OAG. It holds a 28% share of the roughly 5,519 seats on offer. TAAG holds 37% share, Ethiopian a 15% share and Royal Air Maroc a 13% share. TAAG offers flights from Angola to Rio and Sao Paulo, Ethiopian operates service to Sao Paulo from Addis Ababa and Royal Air Maroc serves Guarulhos from Casablanca. The Sao Paulo-Johannesburg route has not been historically successful for South African Airways, and its service to Buenos Aires was cut in Mar-2014 as part of a restructuring plan to restore profitability to the airline. With Brazil’s weak economy – GDP growth has been revised downwards to negative 1.5% – TAM will face challenges in achieving profitability on the route. South Africa has better economic prospects for 2015 with projected GDP growth of 1.5%, but its unemployment rate is high (roughly 25%), and point of sale in Johannesburg could be challenging for TAM. But the TAM-South African Airways codeshare allows each airline to leverage its partner’s brands and to market beyond connections to help boost passenger levels in the market. Even in these circumstances Sao Paulo-Johannesburg may struggle to support two airlines operating service. 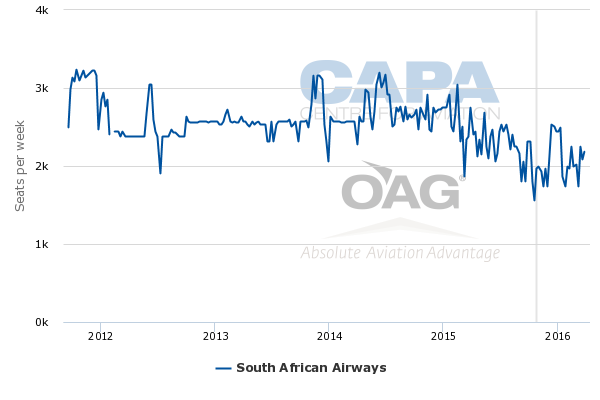 Data from CAPA and OAG show for the week of 19-Oct-2015 South African’s approximate one-way seats between Guarulhos and Johannesburg are down 44% to 1,554, but will grow back to 2,501 in mid-Dec-2015. LATAM is also expanding its reach to the Caribbean, with plans to add flights in Dec-2015 from Bogota and Brasilia to Punta Cana. That service follows the launch of Sao Paulo Guarulhos to Cancun by TAM earlier in 2015. LAN also operates flights between Lima and Punta Cana and between Santiago to Punta Cana as a leg of a flight between Santiago and Miami. Throughout 2015 LATAM has concluded it must cut capacity from weak markets and redeploy the supply to stronger markets, often citing the Caribbean. 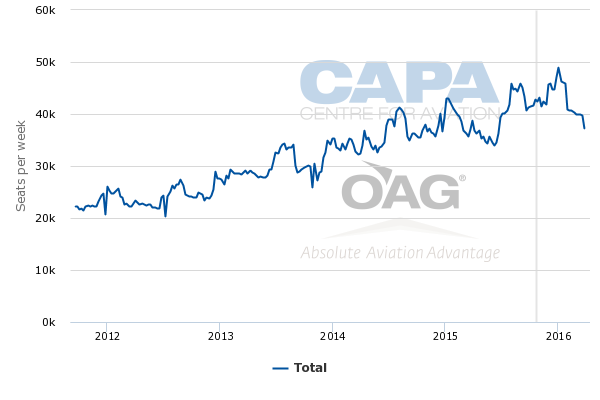 Data from CAPA and OAG show for the week of 19-Oct-2015 LAN’s seats between upper South America and the Caribbean have grown 67% year-on-year and Avianca has recorded a 28% increase. Overall, weekly one-way seats are up 16% year-on-year to approximately 42,745. TAM is uncontested in its new service from Brasilia to Punta Cana, and faces competition from Avianca and Copa on flights between Bogota and Punta Cana. 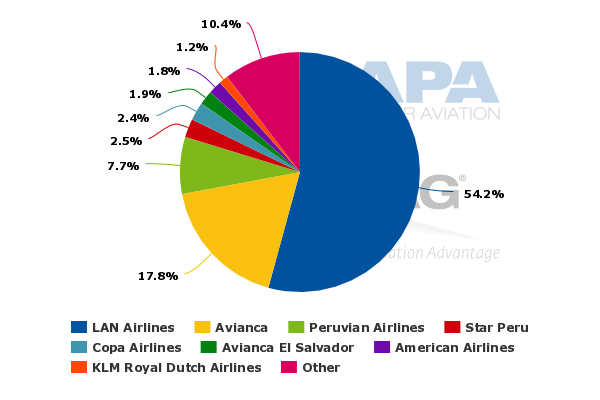 Avianca holds an 88% share of the roughly 1,628 one-way seats on offer for the week 19-Oct-2015 and Copa holds a 12% share. Schedules show that LAN will offer 672 seats initially between Bogota and Punta Cana, dropping down to 336 at the end of Mar-2016. Although Colombia’s currency has faced a rapid currency devaluation – 28% against the USD year on year as of mid-Sep-2015 – its 3.4% forecast GDP growth (lowered from an initial 4.5%) is one of the healthiest in Latin America. Avianca is the dominant airline at Bogota El Dorado with a 63% seat share (19-Oct-2015 to 25-Oct-2015), and LAN Colombia is the second largest airline with a 20% seat share. The Dominican Republic’s GDP growth is forecasted at 5% for 2015, so LATAM is attempting to leverage the demand generated by linking two strong economies while reducing its domestic capacity in Brazil by 2% to 4% in 2015. Elsewhere in its network, TAM is joining LAN and Avianca on service from Sao Paulo to Bogota in early 2016 and cutting flights from Belo Horizonte to Miami. TAM operates Belo Horizonte-Miami alongside its oneworld partner American. With the economic conditions in Brazil, and American’s point of sale strength in the US, LATAM has likely decided to deploy the capacity to other markets. 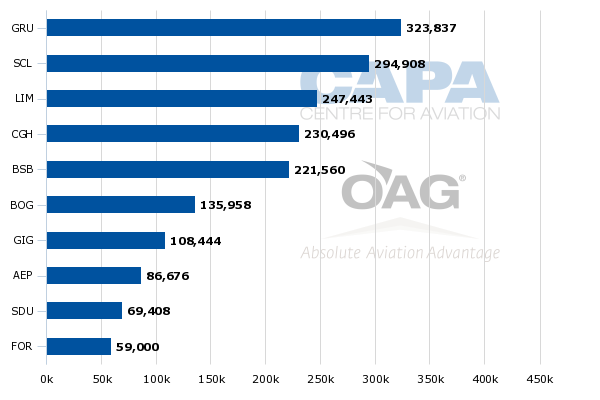 CAPA and OAG data show for the week of 19-Oct-2015 the two airlines offer roughly 1,490 one-way seats on the pairing; American holds a 58% share and TAM a 41% share. Although most of Latin America’s markets remain weak, LATAM has introduced some intra South America routes during 2015 including Brasilia to Buenos Aires and Lima to Antofagasta and Montevideo. The combination of LAN and TAM gave the merged entity a leading position in Latin America, which was a hotbed of demand and traffic growth as recently as a couple of years ago. Conditions have since weakened significantly in the region. Nonetheless, much untapped demand remains in Latin America, and LATAM seems to be positioning itself to exploit the growth potential once economies rebound. For now LATAM is logically attempting to place its capacity where it can be the most profitable, which is a challenge given the conditions it faces in its largest markets. Even as the company looks to the long term, the short term challenges remain dominant, and are lingering into the foreseeable future.